Give staff visual guidance on what to do during a fire. Post this sign in lounges and near pull boxes as a frequent reminder of what to do when there is a fire. 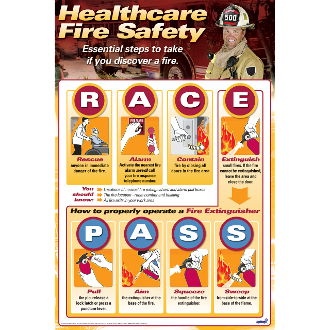 RACE/PASS Pneumonic ensures that your staff will do the right thing during when a fire develops. Frequent exposure to our sign helps embed in staff the steps that they need to take during a fire without having to think about it. Improves fire safety compliance with regulatory agencies. Our Posters are printed digitally with Vivera® Inks on our exclusive ReStix™ repositionable vinyl and finished with disinfectant-safe ProteX™ Satina™ laminate. They also feature a 100- year no-fade guarantee. Add Your Logo: We can easily add your logo, click here for more information.